When letting go of the diet mentality and embracing a non-diet approach, one of the biggest concerns I hear is that it will lead to eating nothing but ice cream, chips and cookies. It can feel scary to truly give yourself unconditional permission to eat and that’s in large part because of the all or nothing thinking that accompanies the diet mentality. In the past you may have related to food in extreme ways – either eating all the ice cream or none of the ice cream. The best way to challenge all or nothing eating is to practice making meals and snacks nourishing AND satisfying. For example: having a cheeseburger with a side salad doesn’t make the side salad automatically unhealthy or the cheeseburger “better”. Our bodies need all of it – carbohydrates, protein, fat (all kinds – saturated and unsaturated! ), fiber, vitamins, minerals,etc. Another example: eating vegetables on a diet usually means using tasteless and bland cooking methods. 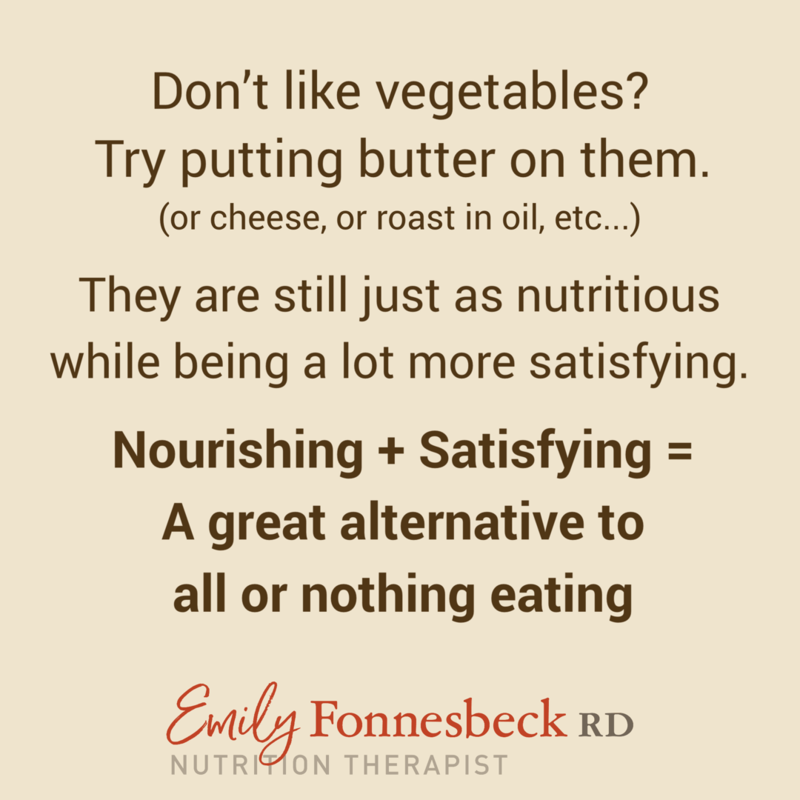 Eating vegetables with butter or cheese or roasting them in oil would make them nourishing and satisfying. One more: A green smoothie in the morning may leave you hungry an hour later. If you like the green smoothie but want breakfast to last longer, what if you added toast and PB… or a donut? To truly make peace with food, you may need to redefine what “healthy” actually means. We tend to make it very objective — normal lipid profiles, blood pressure within an ideal range, consistent blood sugar levels, etc. Of course, these can be helpful data to assess health, but we may want to dig deeper into our overall well-being, not just numbers on a page. We also can easily accept the popular message that healthy eating equals restrictive eating, which means we leave off the butter or oil or salt that enhances the natural flavor of food. Clearly, it’s essential we factor in satisfaction to “healthy eating”. Ellyn Satter, registered dietitian and eating competence expert, has said, “When the joy goes out of eating, nutrition suffers.” We are hard-wired to feel satisfaction from food and, as noted in the above study, it’s actually tied to overall nutritional adequacy. You may find that giving yourself permission to feel satisfied actually allows you to settle into something flexible and nourishing. And that’s just it – it’s wise to assess nourishment and satisfaction by looking at food patterns as a whole rather than one meal or one snack. At the same time, it could be a helpful exercise for challenging all or nothing thinking by taking a fear food and finding ways to incorporate it into meals and snacks. Maybe you want a cookie with scrambled eggs and fruit for breakfast. Use higher fat (and higher flavor!) condiments on a sandwich with protein, cheese and veggies. End each meal with something sweet instead of feeling like you need the whole pan of brownies after avoiding sugar for a week. Use your favorite cereal as a mix in for yogurt and combine with fruit and nuts. Obviously this isn’t an exhaustive list. And maybe you just want a cookie. But essentially, take a food you love and would likely cut out if you were on a diet and find ways to add it to your regular eating patterns in a way that feels nourishing and satisfying. As simple (and maybe scary) as it may sound, I really feel this is the key to seeing that all foods can fit.